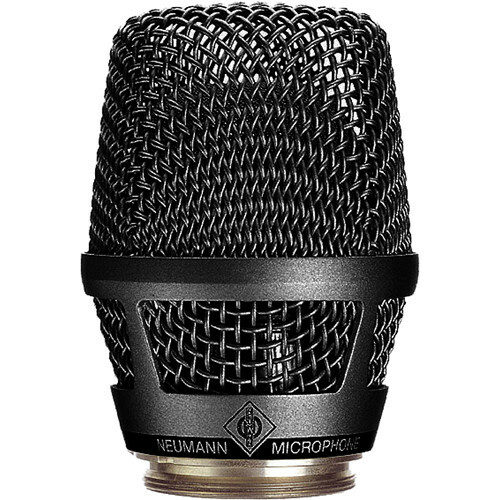 The black Neumann KK 105 HD Capsule Head combines with the Sennheiser SKM 5200 / SKM 5000 N Wireless Systems to take sound into the wireless domain, thus opening up new dimensions for sophisticated live-performance engineering. In terms of engineering, the KK 105 HD is a wireless variant of the KMS 105, 140, and 150 family of wired vocalist microphones. It inherits not only their impressive tonal characteristics and specifications, but also their sturdiness and efficiency in suppressing popping and handling noise. The Sennheiser SKM 5200 and SKM 5000 N handheld transmitters are advanced versions of the SKM 5000, optimized for the capsule head, and ensuring reliable, interference-free, high-quality transmission of the capsule signal to the corresponding Sennheiser receiver. The capsule is available in a black-colored nickel finish to coordinate with the handheld transmitter. It also comes in a spacious, roadworthy nylon pouch, big enough to hold not only the capsule, but the transmitter (sold separately), battery packs (sold separately), and additional accessories (sold separately) as well. This heavy-duty capsule features integrated foam pop-screen instead of wire mesh for even better plosive attenuation. In addition, the foam material provides a very large surface area and can therefore absorb moisture very well. Note: Existing Sennheiser SKM 5000 transmitter can be upgraded with the KK 105 HD capsule. To take full advantage of acoustical properties of the head it is recommended to utilize it with SKM 5200 / 5000 N.
These are just some of the most common applications. Additional experimentation is recommended to gain maximum use from this microphone. According to IEC 60268-1; CCIR-weighting acccording to CCIR 468-3, quasi peak; A-weighting according to IEC 61672-1, RMS. THD of microphone amplifier at an input voltage equivalent to the capsule output at the specified SPL. Box Dimensions (LxWxH) 12.0 x 3.8 x 2.9"